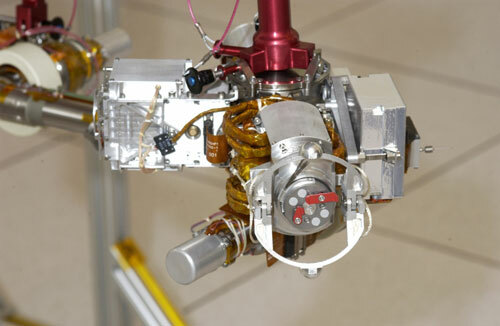 In-situ instrumentation enables the collection of Mars data from the surface. Having the ability to rove on the red planet allows for up-close inspection of martian rocks, dunes and other compelling features. Like the geologists they are meant to mimic, Spirit and Opportunity have arms, or Instrument Deployment Devices, at the end of which are a handful of very powerful instruments. 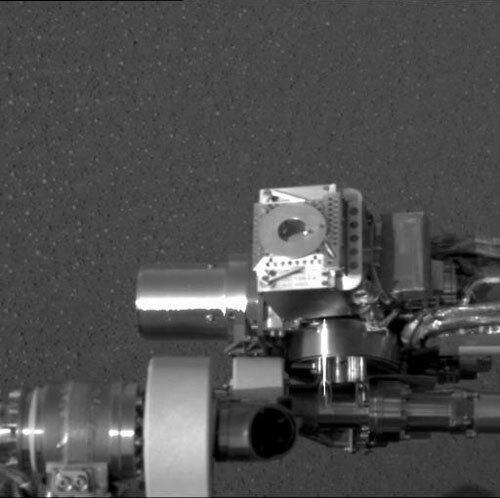 One of four main instruments at the end of the rover's instrument deployment device (or "arm"), the rock abrasion tool (RAT) is featured just right of center in this image. On February 6, 2004, the rock abrasion tool (RAT) performed history's first grinding of a rock on Mars. 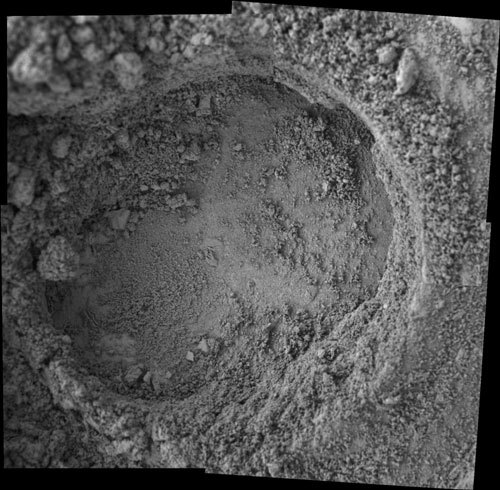 Spirit's RAT ground off the surface of a patch 45.5 millimeters (1.8 inches) in diameter on a rock called Adirondack. The lightweight tool, comparable in size to a 12-ounce soda can, is capable of brushing and grinding rocks and has been critical in the search for ancient traces of water on Mars. Well into the extended mission, both rovers' RATs have ground a combined total of over two dozen holes in rocks of varying hardness. 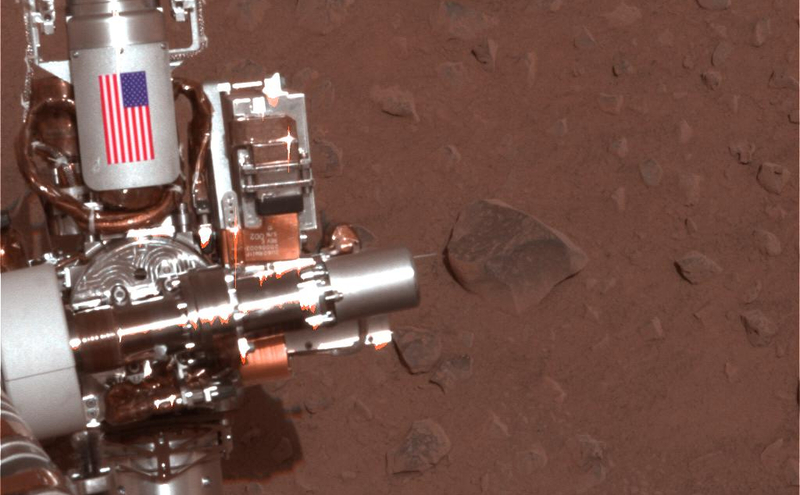 The first step in getting beneath the dust of many millennia, RAT operations have revealed the undersurface of rocks for the rover's spectrometers to investigate. Knowing the elemental composition of rocks and soil is the key to understanding their formation. Over the course of both rovers' missions, onboard spectrometers confirmed the presence of the mineral hematite that was, in the case of Opportunity's Meridiani Planum landing site, strongly indicated from orbital data. The Miniature Thermal Emission Spectrometer (Mini-TES) has brought to the martian surface essentially the same technology that its sister instruments orbiting Mars aboard Odyssey and Mars Global Surveyor use. The spectrometer is used for remote investigation of mineralogy of rocks and soils. Operating in the thermal infrared region of the spectrum, it identifies rock-forming minerals, and also provides some capability to see through dust coatings that could tend to obscure spectral features of rocks. The mineralogical information that Mini-TES provides is consistently used to select from a distance the rocks and soils that will be investigated in more detail. Along with its mineralogical capabilities, Mini-TES collects data on the thermal properties of rocks and soils. Viewing upward, it can also provide temperature profiles through the Martian atmospheric boundary layer - the layer of atmosphere from the surface to an altitude of 10 kilometers (6.2 miles), and one that cannot be well understood from orbital instruments alone. This instrument's ability to detect the composition and abundance of iron-bearing minerals has been critical during the rover mission. The specialized Moessbauer Spectrometer specifically provides the detailed mineralogy of different kinds of iron-bearing rocks and soils. Placed directly up against target material, the spectrometer illuminates rock surfaces with gamma particles emitted by cobalt-57. The particles interact with the nuclei of the atoms in the targeted material, and characteristics of the radiation reflected back, or "backscattered," into the spectrometer are recorded and measured to determine the presence, amount and types of iron-bearing minerals. The Alpha Particle X-ray Spectrometer (APXS) works by exposing martian materials to energetic alpha particles and X-rays from curium-244, and then measuring the energy spectra of backscattered alpha and X-radiation. The instrument is conceptually similar to but an updated and more capable version of the APXS instrument that was used on the Mars Pathfinder Sojourner rover. 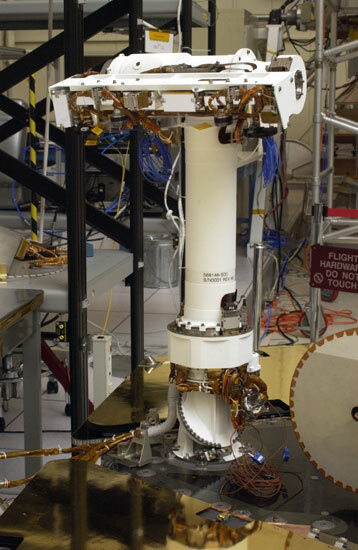 The panoramic camera mast assembly (PMA) serves as the rover's "neck" and "head." Atop the "head" are the twin "eyes" of the panoramic camera as well as those of the navigation camera. The flexible "head" tilts and rotates and allows the cameras to take spectacular images. The Panoramic camera (Pancam) color imaging system has, by far, the best capability of any camera ever sent to the surface of another planet. The Pancam Mast Assembly (PMA) allows the cameras to rotate a full 360* to obtain a panoramic view of the martian landscape. The camera bar itself can swing up or down through 180* of elevation. The Pancam cameras are small enough to fit in the palm of your hand (270 grams or about 9 ounces), but can generate panoramic image mosaics as large as 4,000 pixels high and 24,000 pixels around. Pancam detectors are CCDs (charge coupled devices). These devices form the image, just as film does in a film camera. Each "eye" of the Pancam carries a filter wheel that gives Pancam its multispectral imaging capabilities. Images taken at various wavelengths help scientists learn more about the minerals found in martian rocks and soils. Blue and infrared solar filters allow the camera to image the sun. These data, along with images of the sky at a variety of wavelengths, have helped to determine the orientation of the rover and have provided information about the dust in the atmosphere of Mars. 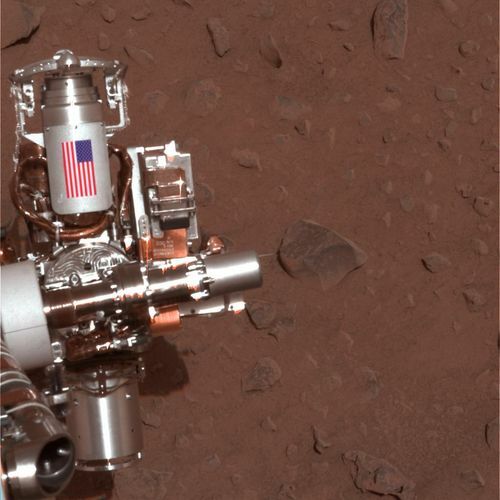 The Microscopic Imager (MI), like the RAT and the spectrometers, is located on the "fist" of the rover arm. It is a combination of a microscope and a CCD camera that provides information on the small-scale features of martian rocks and soils. The MI has served as a valuable tool to scientists, allowing them to characterize the undersurface of rocks. When able to see beneath the outer, weathered coating and layers of dust, scientists can better determine how the rocks formed.